Think of how Cappuccino made coffee more exciting. Appucino wants to make your already exciting app even more exciting! In short, it's a non intrusive interactive tray that sits invisibly in your app. When your user pauses your app or is ready to exit, Appucino appears and its magical brew of chat, leaderboards and gifting makes your user stay on and get more involved and engaged in your app Check out how! What can I use Appucino with? Appucino can be used with your iOS or Android applications. What's more, if you operate a mobile-portal, we can rapidly hand you an iOS or Android application with all the cool features of Appucino around your content! What's the difference between Appucino and OpenFeint? Appucino has its own unique location based leaderboards and social layer, that is designed to increase user engagement. It has entirely customisable leader names, and gives the developer the option of defining their favicons that appear on the map. 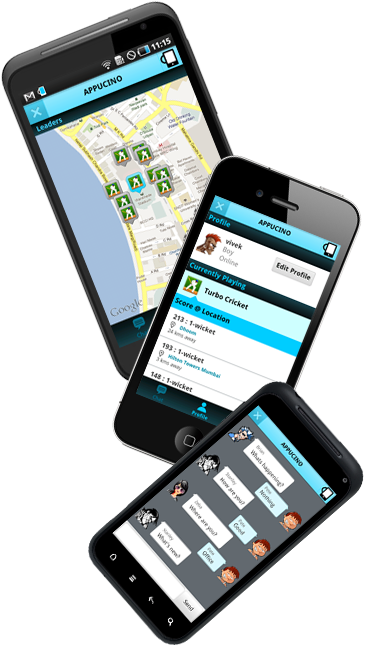 Appucino chat allows you to make new friends rather than chat with only existing ones. Users will meet new people around them, as well as others from all around the world. What notifications do users get in Appucino? And how do they receive them? Appucino users get notified about friend requests, messages and leaderboard challenges. While in Appucino, a highlighted inbox notifies the user to check his unread messages. The user also receives push notifications on his device when outside the Appucino world. Does Appucino appear in my app all the time? No it does not. The developer has full freedom in deciding where Appucino will appear in the application. It can appear when the user presses the pause button or on any static screen within the application. What is the size of Appucino? Does Appucino conflict in any way with my app code/cause it to crash etc? Not at all! Appucino is safe for your app. Do users have to register for Appucino? No, they do not have to. Users can enter the Appucino world and meet and compete with others before they decide to register. Users can also use their Facebook id to login, so it's painless. Will the Ads in my App get affected due to Appucino? Not at all! You can have all kinds of ads in your app. In fact, Appucino will help increase your app consumption, resulting in increased ad revenues. Will my in-app purchases get affected due to Appucino? Do I have to share the revenue on my in-app purchases with Appucino? Not at all! Your in-game revenues are all yours. What reports can I get from Appucino? All the information and analytics on your users and their consumption behavior, will be provided to you on a simple dashboard. Can I run OpenFeint, Gamecenter and Appucino SDK on the same app? How much does Appucino cost? How does Appucino make me money?! We believe that virtual gifting is a very exciting social feature that gets people to spend a little in making new friends and pleasing existing ones! I mean who doesn't like getting gifts! Since we spend all our energies making the gifting section really interesting, your users are tempted to buy something for their friends. When they do buy, you - the app developer gets the lion's share (70%) of that revenue! If you want to get in touch with us or need some assistance in integrating the Appucino SDK, write to us at help@appucino.com.